Ruthie needs a day off from school, but the weekend seems too far away. A snow day would be just right. She could wish for a snow day, she could hope for a snow day, or she could make her own snow day. There are people in the desert who dance for rain; why not a dance for snow? Ruthie makes up her own dance and a song to go with it. As she goes through her day, the colorful characters at her school seem ready for a break in their routine as well. Kids will sing and dance along with Ruthie as she teaches her song and dance to her friends, the bus driver, the lunch room lady, and even the principal. Eventually everyone (even the adults) give it a try. The town is thrilled to wake up to a world of white the next morning. Anyone who has ever hoped for an unexpected day off will appreciate the anticipation created by the characters’ thoughts of what they would rather be doing. 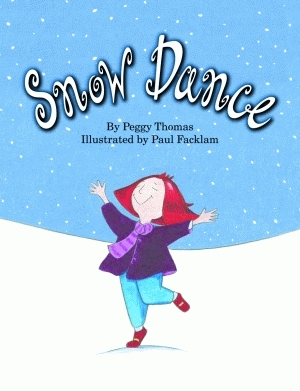 Peggy Thomas has published many noteworthy children’s books. Among her awards, she has been recognized by NYLA for one of the Best Books of the Summer for 2005 and by the New York Public Library for a 1999 Book for the Teen Age. One of her natural sciences books was chosen as an NSTA-CBC Outstanding Science Trade Book for Children and another was named an ALA recommended book for Reluctant Young Adult Readers. A member of the Society of Children’s Book writers and Illustrators, she is a library associate and an instructor for the Institute of Children’s Literature. Paul Facklam is an elementary-school art teacher in Middleport, New York. The brother of author Peggy Thomas, Facklam has also illustrated children’s books for his mother, one of which, The Big Bug Book, received a 1995 Notable Children’s Book Award. WHEN THE RAIN CAME DOWN IN BAYOU TOWN!